SciPhysicsForums.com • View topic - Are Gill and Moldoveanu disingenuous or incompetent? Are Gill and Moldoveanu disingenuous or incompetent? The question that has been puzzling me lately is: Are some of the critics of my work -- such as Gill and Moldoveanu -- deliberately deceitful, or merely incompetent? Take, for example, Moldoveanu's recent blog post about my work. Evidently, the purpose of his blog post is to mislead the scientific community about my work, either deliberately, or because of his own incompetence in elementary mathematics and physics (I will come to Gill's incompetence in mathematics and physics in a minute). This travesty of my model is of course completely bogus, as anyone who has actually read my papers would recognize at once. I would not even call it a "straw-man." It is far worse than that. But I am very pleased that Moldoveanu has himself exposed his incompetence so vividly on his blog, so that we can enjoy it with a chuckle. (2) In reality, my model is "all about" correlations among the points of a parallelized 3-sphere, and as such it has nothing to do with either the definition of the cross product or complex numbers. This has been pointed out to Moldoveanu, literally hundreds of times, by me as well as others, but he has learned nothing. Check out, for example, this paper, where I systematically debunk dozens of his silly claims about my model. In essence, it is the orientation of S^3 that matters, nothing else. (3) More specifically, the definition of the cross product, as in , is just fine. Cross product is universally defined by the right hand rule, including in my model. where is not the usual imaginary of the complex numbers but a trivector, or a volume form, which is a real geometrical object representing the orientation of the physical space, in this case that of a parallelized 3-sphere. In other words the sign of the trivector represents the overall orientation of the parallelized 3-sphere. Thus , for example, represents a bivector dual to the vector in the right-handed orientation of the 3-sphere, and represents a bivector dual to the vector in the left-handed orientation of the 3-sphere. As anyone can see, this physical scenario is dramatically different from what Moldoveanu has presented. (5) The reason Moldoveanu remains confused about such elementary matters is because he continues to think in terms of complex numbers, which, as already noted, have nothing to do with my model. Complex numbers do not have handedness (or orientation). There is no such thing as left-handed complex numbers or right-handed complex numbers. Moreover, complex numbers are commutative numbers, whereas a parallelized 3-sphere can only be correctly represented by quaternions, which of course do not commute. A parallelized 3-sphere is a set of unit quaternions, which, in turn, is a well known solution of Einstein's field equations of general relativity. http://arxiv.org/abs/1501.03393 (see, especially, the derivation of the Eq. (B10) in this paper). There is therefore no excuse for Moldoveanu and Gill to continue to make their bogus claims without paying attention to the arguments presented in these documents. What is more, as anyone who has been following my work with a positive and/or neutral attitude knows, by now there have been many explicit, even event-by-event simulations of both my original Clifford algebraic model of 2007 as well as that of a non-Clifford algebraic representation of the 3-sphere, such as this new simulation. This brings us back to my question: Are some of the critics of my work, in particular Gill, Moldoveanu, and Weatherall, deliberately deceitful, or merely incompetent? Now Moldoveanu seems to be just incompetent and misguided. Evidently, after Fred Diether and I have explained his mistakes to him literally hundreds of times, he still remains entirely clueless about what the hidden variable is in my model (as we saw above, it isn't what he think it is). This is understandable, since unlike Gill and Weatherall, Moldoveanu's academic credentials are non-existent. Although he has managed to post several questionable preprints on the arXiv, he has not been able to publish a single one of his preprints in a refereed journal in his entire lifetime. On the other hand, in his past online interactions with me, Fred Diether, Tom Ray, and several others, he has habitually manifested a tendency to be deceitful and abusive. In fact, he was made to publicly apologize to me by both the FQXi and arXiv administrators for using abusive language on the FQXi blogs, and for falsely accusing me of blocking his preprints from being publicized on the physics archives. More surprising is the fact that Gill makes the same algebraic and conceptual blunders as Moldoveanu despite the fact that he holds a professorship in mathematical statistics at a well known Dutch university. He has, however, admitted both publicly on these very pages as well as privately that he cannot do algebra. In fact, I and others have repeatedly exposed on these pages, not only his algebraic blunders, but also his duplicitous character and vested interests: (1), (2). He is evidently in the business of constantly misleading the scientific community by subterfuge. Thus there is not much of a mystery about the intentions, motivations, and actions of Gill. Weatherall, on the other hand, is a young philosopher, also holding an academic position. I am prepared to overlook the physical and mathematical deficiencies in his "analysis" (and there are plenty), but what is astonishing is that he either deliberately or inadvertently sets out to commit one of the most elementary logical fallacies that any competent philosopher would have been extra vigilant about. He commits the straw-man fallacy so blatantly that only a true Bell believer would fall for it. Needless to say, this is outright dishonesty, designed to mislead the scientific community. He sets out to give a false impression in his paper that he is going to discuss my model for the EPR-Bohm correlation, but what he actually discusses in his paper and refutes has nothing whatsoever to do with my model. In fact what he does is nothing more than present a 50 year old trite argument by Bell and his followers which we have already seen being demolished on these pages many times over. Since I have debunked Weatherall's argument in considerable detail in the paper I have linked above, I will refrain here from discussing the duplicity of his paper once again. Thus there is sufficient evidence to conclude that all three of the critics, Gill, Moldoveanu, and Weatherall, are deliberately deceitful and manifestly incompetent. No matter how one looks at it, it is quite evident that the only way these critics are able to criticise my model is by first replacing it with their own grotesque straw-man. Re: Are Gill and Moldoveanu disingenuous or incompetent? To answer the question of the title; they are probably both. Also pretty amazing that they still don't know what a physics postulate is after all this debate. Joy, why not reply at my blog? I do not delete or censor comments there. Florin wrote: Joy, why not reply at my blog? I do not delete or censor comments there. Why not just respond to what Joy said here? No problem as long as you don't spam the forum with many overly repetitious replies. FrediFizzx wrote: To answer the question of the title; they are probably both. Also pretty amazing that they still don't know what a physics postulate is after all this debate. It is indeed amazing that they still do not understand what the physical postulate (or the hidden variable) is in my model, despite the fact that it was pointed out to them by several of us, as well as by Bill Schnieder, quite explicitly, a very long time ago: viewtopic.php?f=6&t=49&p=2545&hilit=third+rate#p2545. The problem for them is that if they understood what it is and accept it, then their whole "argument" falls apart. Their only option is to continue to make their disingenuous claims. Joy is on record stating the cross product averages out over “Nature’s fair coin choice of orientation”. This is categorically incorrect. The math involved for S^3 is the quaternion algebra isomorphic to the bivector subalgebra of GA Joy uses. This is not disputable. The orientation choices for S^3 are a direct byproduct of the two chiral choices for the definition of quaternion algebra. So we have indeed dispatched the non-scalar portion. But this is NOT what Joy is doing. A and B are PRODUCTS, which complicates things a bit. Let a and b be right handed algebraic elements, and a’ and b’ be left handed algebraic element representations using the same coefficients as a and b. We then have four possible combinations of handedness products: C = a*b, D = a*b’, E = a’*b and F = a’*b’. Once again, to make any kind of correspondence between C, D, E and F we must first map each expression to a SINGULAR basis set. Trust me when I say it does not matter if we map e to f or f to e, the cross product cannot be removed by any combination of chiral forms. If you do not trust me, well do the damn math for yourself! I am going to map f to e for C, D, E, and F.
So with pure bivectors (quaternions) we have C = –D = –E = F. Since these are the ONLY chiral combinations available, there is absolutely no way to clear the non-scalar component of a sum of similar products of pure bivectors through any possible modification of orientation for individual products. QED. The above comments by Rick Lockyer only serve to illustrate how easy it is to commit the straw-man fallacy. To be fair to Lockyer, unlike Gill, Moldoveanu, and Weatherall, he is mathematically competent. Sadly, however, he is physically quite clueless, and that undermines his mathematical abilities dramatically. As Einstein once said to have said: "the man can calculate, but he cannot think." Until Lockyer learns my actual model and learns the physics and mathematics of the EPR-Bohm experiment, I will not be responding to any further comments by him. Rick Lockyer wrote: But this is NOT what Joy is doing. A and B are PRODUCTS, which complicates things a bit. Let a and b be right handed algebraic elements, and a’ and b’ be left handed algebraic element representations using the same coefficients as a and b. We then have four possible combinations of handedness products: C = a*b, D = a*b’, E = a’*b and F = a’*b’. Once again, to make any kind of correspondence between C, D, E and F we must first map each expression to a SINGULAR basis set. Trust me when I say it does not matter if we map e to f or f to e, the cross product cannot be removed by any combination of chiral forms. If you do not trust me, well do the damn math for yourself! Fortunately, we did the math using the GAViewer program which confirms that Joy is correct about his classical local realistic model. Keeping in mind that GAViewer is in a fixed right handed bivector basis and that AB is a geometric product. Here is the code which you can run for yourself in GAViewer. s=s+q; //summation of all terms. //The scalar parts match and others vanish! Proving the result is -a.b. //realistic counter-example that in fact contradicts Bell's theorem. Michel Fodje did a Python version that works as well. I was just going to ask the same thing! The code you posted debunks such arguments. Now that Bell's "theorem" is totally demolished, what's next? Before someone produces yet another silly objection, let me add here that the non-scalar (or bivector) term in the codes posted by Fred actually vanishes EXACTLY in the analytical Eq. (19) displayed by Albert Jan from my 2007 paper. The numerical simulation of Eq. (19), however, necessarily requires replacing the Riemann integral in Eq. (19) by a discrete sum over a large N. And therefore a small --- but statistically insignificant --- residue of the non-scalar term remains for any finite N.
This is NOT Joy's equation 6. It is not created with an orientation change. Take an even number of different pure bivectors and swap the order. what do you get? The conjugate?? So what you really proved here is A + conjugate(A) is twice the real component of A, and when you have a random distribution of different A's and an equal probability of conjugate(A) the non-scalar component will tend towards zero. This is a straw man supportive (non)proof. Joy wants a statistical even chance of something and its conjugate, he just does not have it with his "fair coin orientation choice". The above proof shows this is not possible. C = F, not its conjugate. Mathematical system orientation is a free choice for the physicist, nature does not care because it is a symmetry, a very important symmetry. All observable physical phenomenon are consistently defined for all possible orientations of the mathematical system (read that algebra). The electron moves the same direction when travelling through a magnetic field whether you use a right handed system or a left handed system. 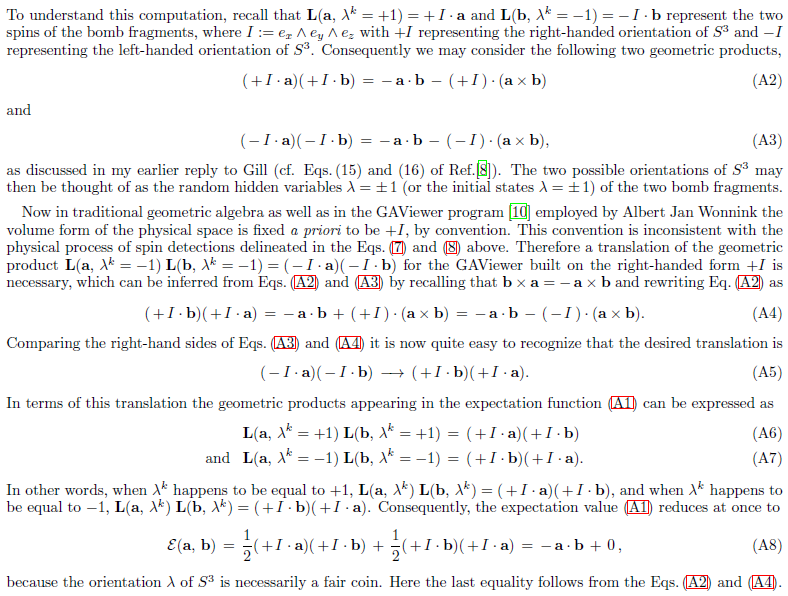 This is more important in Octonion Algebra, where there are 16 different orientations. Still, all observables described with Octonions yield the same result independent of which of the 16 used. This is my "Law of Octonion Algebraic Invariance". It works, as my demonstration of the Octonion stress-energy-momentum tensor equivalent shows, properly including Electrodynamics as a subset, just as Electrodynamics is a subset of the totality of our reality. All of your so called proofs either include Joy's erroneous statement, or something similar that yields the same erroneous result. Orientation choice, as I have been telling Joy for years now, is a non-starter. Joy Christian wrote: Thanks Fred, thanks Michel. You're welcome. Yes, anyone that doesn't understand that would have to be mathematically incompetent. 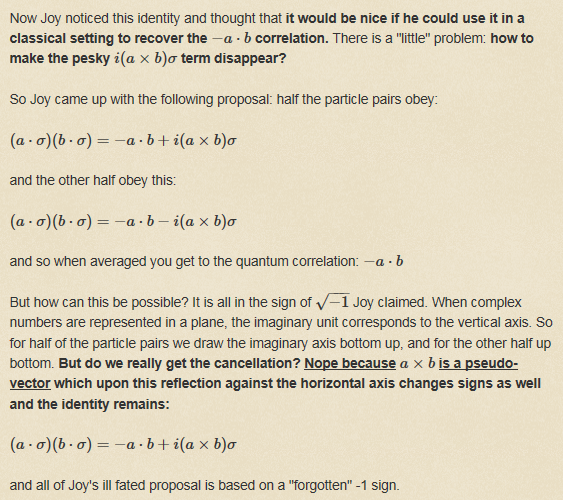 This is NOT Joy's equation 6. ??? This is exactly Joy's eq. (6) for the GAViewer simulation. I think you still don't understand the physics. And / or there must be something you don't understand about that code expression. Rick Lockyer wrote: Orientation choice, as I have been telling Joy for years now, is a non-starter. I think I found your problem. There is no "orientation choice" in Joy's model. And that can well be seen if you understand the GAViewer code and program. GAViewer works in a fixed right handed basis only. There is no "choice". There is only a random 50-50 chance (not "choice") in Nature that a particle pair will be created with a left or right handed orientation. What happens when you look at a left handed system from a right hand only perspective? The order is reversed. Very simple. It seems to me that the problem is having a convention of +I for physical space (which is S^3 in your model). (Though I can see that is necessary in the limited dimensions seemingly allowed in GAViewer, and in the sub-space of GA you chose for your model.) Is it not possible to work instead in higher dimensions, or in an all-enclosing hypervolume, as you may be doing in different circumstances in other papers. In such an all-enclosing hypervolume, which itself could have a sign convention for its torsion [eg for an all enclosing, say, S^7, or whatever], wouldn't the trivectors be free to take whatever signs they are naturally created with, and would there then not be an artificial need to swap any signs because of any trivector convention? Or would the same problem still arise? My wife received last week a metal bracelet in the form of a Moibus strip birthday present. I managed to convince her that it only had one side as it had a long quotation inscribed on it. But I did not even try to suggest to her that it was only two- dimensional. Likewise, I do not see how, in physics, the S^3 can have a torsion without there being at extra dimensions for it to twist in. But in maths maybe it is OK? FrediFizzx wrote: Rick Lockyer said: "Orientation choice, as I have been telling Joy for years now, is a non-starter." Fred is right. Christian's model depends on two geometric products: the usual one (right-handed), let us denote it by (*_R), and a left-handed one, let me denote it by (*_L). GAViewer has the right-handed one built in and used by default. The relation between them is simply x (*_L) y = y (*_R) x. The right-handed one belongs to the oriented volume element +L and the left-handed one to -L. Usually we just write y x for y (*_R) x, but it would be wise to notationally differentiate between the two geometric products explicitly. Ben6993 wrote: My wife received last week a metal bracelet in the form of a Moibus strip birthday present. That is the best piece of news / information, Ben, in all of these threads put together. Belated Happy Birthday to your wife. I was also born in July, by the way. Ben6993 wrote: It seems to me that the problem is having a convention of +I for physical space (which is S^3 in your model). (Though I can see that is necessary in the limited dimensions seemingly allowed in GAViewer, and in the sub-space of GA you chose for your model.) Is it not possible to work instead in higher dimensions, or in an all-enclosing hypervolume, as you may be doing in different circumstances in other papers. In such an all-enclosing hypervolume, which itself could have a sign convention for its torsion [eg for an all enclosing, say, S^7, or whatever], wouldn't the trivectors be free to take whatever signs they are naturally created with, and would there then not be an artificial need to swap any signs because of any trivector convention? Or would the same problem still arise? I do not see the relative sign of the volume form, "I", as a "convention." It is an intrinsic freedom in any manifold, and especially in the spaces like S^3 and S^7. This freedom is usually neglected, or artificially curtailed, by the mathematicians, because of their own laziness or incompetence in dealing with it in a creative manner. By contrast, I have argued that this freedom is essential for understanding the quantum phenomena like "entanglement." Not surprisingly, this freedom is even richer in S^7, and allows us to derive ALL quantum correlations in local-realistic manner, as I have shown in some of my papers (cf. the theorem on page 12 of this paper). Ben6993 wrote: ..I do not see how, in physics, the S^3 can have a torsion without there being at extra dimensions for it to twist in. But in maths maybe it is OK? Torsion is a tensor, just as a metric of any space, and its curvature, are tensors. So torsion is defined intrinsically at every point of any space. There is no need for a higher-dimensional space to understand it. If you understand the difference between the intrinsic and extrinsic curvature of a space, then you should also understand the difference between the intrinsic and extrinsic torsion. The torsion I talk about in my papers is intrinsic torsion, specified by a tensor at every point of that space. There is a huge difference between a computer simulation in which certain laws of physics are presumed and encoded in an algorithm and a physics experiment which at its best makes no such presumptions. What will settle the question as to whether reality is local or non-local are actual physical experiments where all the parameters of every single event are taken into account. Dr. Pizzella, a member of a group of physicist at the Italian Institute for Nuclear Physics, sent me this link http://arxiv.org/abs/1211.2913 to a paper which he co-authored. The paper describes an experiment they performed that aimed to measure the speed of propagation of the Coulomb Field. Measurements done in 2012, later confirmed by new measurements in 2014, indicate the Coulomb Field propagate instantaneously. If (when) those results are confirmed, they will also suggest that gravity is also instantaneous. It’s not too hard to show that if Coulomb field and gravity are instantaneous (something that should know in about two years), then the entire universe is local and Bell’s theorem and all the questions it raises become moot. The dispute will never ever be settled by computer simulations but by actual physical experiments. It sad to see so much energy spent on Bell theorem, experiments and simulation when in the end it will prove to be inconsequential.